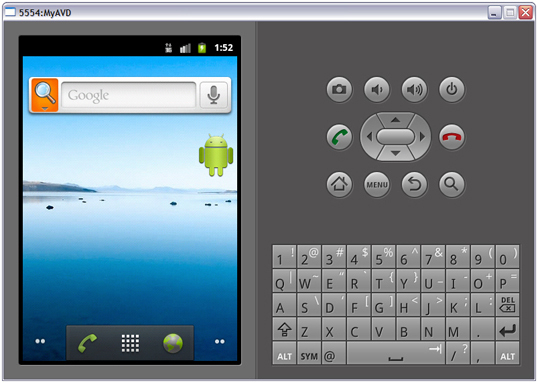 An Android Virtual Device (AVD) is a device configuration that is run within the Android emulator. 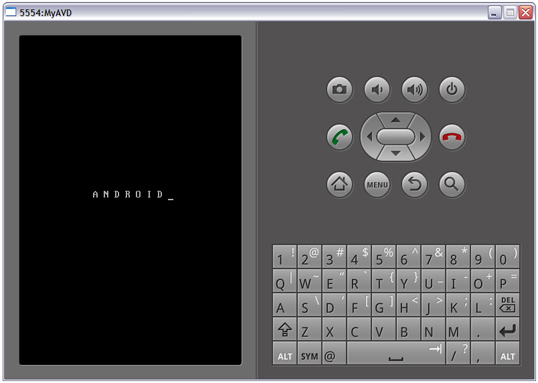 It works with the emulator to provide a virtual device-specific environment in which to install and run Android apps. This tutorial shows you how to launch the previously created AVD via the Android SDK’s AVD Manager tool. Assuming that you’ve created MyAVD, you’ll want to launch this AVD with the emulator. Begin by running the Android SDK’s AVD Manager tool, or run SDK Manager and select Manage AVDs from the Tools menu. You should see an Android Virtual Device Manager window that’s similar to Figure 12. 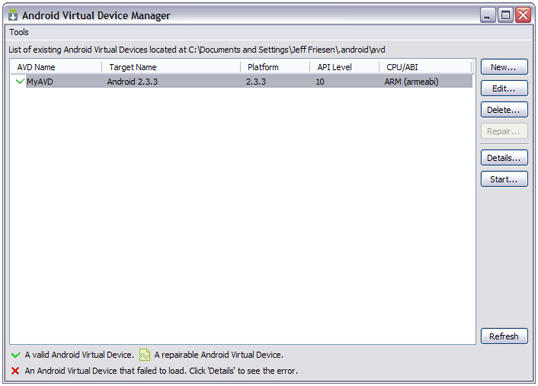 Figure 12: Android Virtual Device Manager identifies an AVD named MyAVD. Android Virtual Device Manager presents a list of previously created AVDs, of which there is only MyAVD in Figure 12. Highlight this AVD, which enables the Start button, and click this button to begin the process of launching MyAVD. 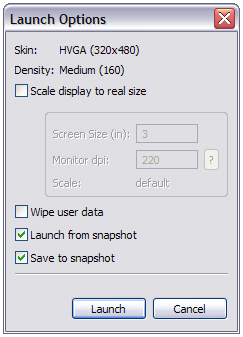 Figure 13 shows you the resulting Launch Options dialog box. Figure 13: Launch Options identifies the AVD’s skin and density, and provides several launch options. Scale display to real size causes the resolution of the emulator’s display to be scaled to match the screen size (in terms of inches and dots per inch) of the physical Android device being emulated, when checked. Launch from snapshot causes the emulated device to be started from a previously saved snapshot of the device’s state, when checked. This checkbox defaults to being checked for an AVD created with snapshot enabled. Save to snapshot causes the emulated device’s state to be saved to a snapshot upon device exit, when checked. This checkbox defaults to being checked for an AVD created with snapshot enabled. The final two checkboxes refer to a snapshot, which is a stored file of emulator state. The emulator launches much faster when launched from a snapshot. Keep the settings that are shown in Figure 13 and click the Launch button. On a Windows XP platform, you will see a few command windows flash by and then you’ll see Figure 14’s emulator window. Figure 14: The emulator window is divided into a device screen on the left, as well as phone controls and a keyboard on the right. Figure 14 also shows that the emulator window consists of a device screen on the left and phone controls/keyboard on the right. The device screen initially displays “A N D R O I D _”, and then displays the graphical logo shown in Figure 15 while the Android platform associated with the AVD is initializing. Figure 15: The graphical ANDROID logo has an animated shimmer effect. Caution: If Figure 15’s ANDROID logo appears for more than 15-30 minutes, something has probably gone wrong. Reboot your computer, start AVD Manager, delete MyAVD, recreate this AVD, and relaunch MyAVD. After several minutes, this logo is replaced with the home screen that’s shown in Figure 16. Figure 16: The home screen is your starting point for interacting with Android. The home screen is a special app that displays a wallpaper background. A statusbar appears above the home screen (and every app screen), presenting access to notifications, the amount of battery power that’s remaining, the current time, and other information. At the bottom of the home screen is the app launcher. The app launcher consists of phone and globe icons providing rapid access to the commonly used phone and web browser apps. It also consists of a rectangular grid icon that (when clicked) takes you to an app launcher screen of app icons. You can click any of these app icons to launch the respective app. Google has organized the home screen around multiple panes, with Figure 16’s pane being the default pane. Click the dots on either side of the app launcher to replace the current pane with the pane to its left or right. This is how you access additional content not visible on the default pane. The number of panes yet to be visited on either side is indicated by the number of dots to the left or right of the app launcher. The phone controls reveal a house icon button that takes you back to the home screen when clicked. Also, the MENU button presents a context menu related to the current screen when clicked. Finally, the curved arrow (BACK) button reverts to the previous screen in a stack of screens that were previously visited. Home corresponds to the house icon button. F2 or Page Up corresponds to the MENU button. Esc corresponds to the curved arrow button. When the home screen appears, it may not look like the screen shown in Figure 16. Instead, it might look like the screen shown in Figure 17. 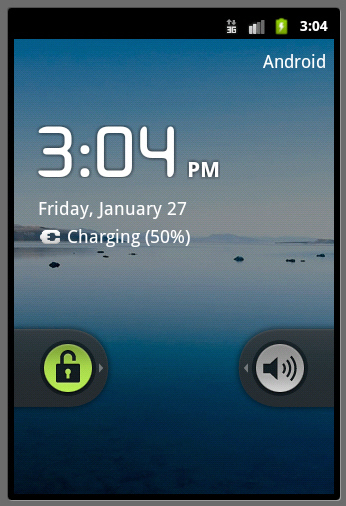 Figure 17: The home screen is locked. How do you launch an AVD? Describe the layout of the emulated device’s window.